The vast majority of Business Insider readers based in the United Kingdom believe that Britain should vote to leave the European Union on June 23. Seven days later, the result speaks for itself. 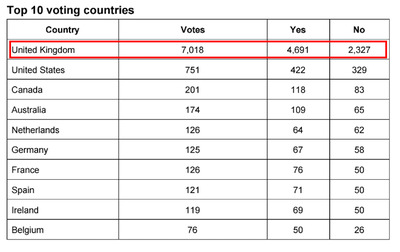 Out of 7,018 UK-based respondents, 4,691 said that Britain ought to leave the 28-nation bloc. This is approximately 67%. The results are broken down country by country below. To put the sample into some context, ICM’s most recent poll was based on responses from just over 3,000 Brits, and YouGov’s surveyed 1,905. However, unlike polling firms, Business Insider was unable to ensure that the poll was representative of the British public. Nevertheless, the result reflects the significant pro-Brexit swing that has taken place across opinion polls over the past week. 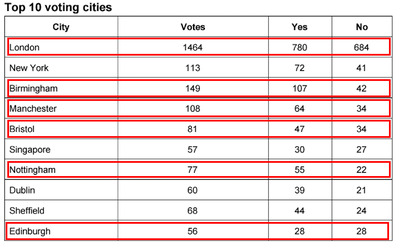 What is even more startling was how Brits voted by city. 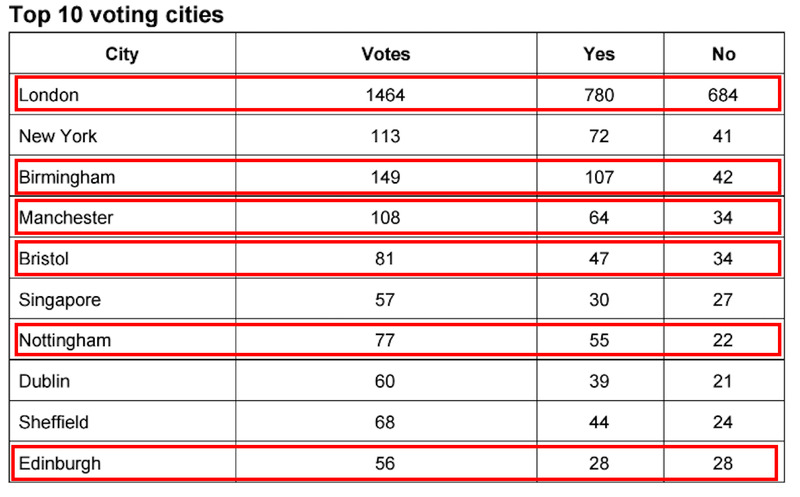 Even respondents in London — generally regarded as a progressive, cosmopolitan city that is more than likely to back Remain — leaned towards a Brexit (780/684). In every other English city, the majority of Business Insider readers want a Brexit to take place next week. In Birmingham and Nottingham, the pro-Brexit vote share was 71%. The only exception was Edinburgh where the vote was split 50/50. This isn’t exactly a flattering statistic for Remain, though, given that Scotland is considered to be the most pro-EU country in the UK. It has been a fantastic week for Brexit campaigners — probably their best yet. On Monday, four opinion polls conducted both over the phone and online showed leads for the Leave campaign. The probability of a Brexit taking place on June 23 is improving almost every day in the betting market too. William Hill is currently odds of 11/8 (42%) — a 20% increase in the space of just two weeks.